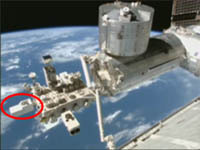 The CALorimetric Electron Telescope (CALET) onboard the Japanese Experiment Module "Kibo" of the International Space Station (ISS) since 2015 has succeeded in observing a tremendous shower of electrons*1(called "Relativistic Electron Precipitation: REP") for a few minutes as the ISS passed through a high geomagnetic latitude*2 area, indicating that REP had also occurred around the ISS. From the data obtained, REP is considered to be electrons precipitated from the Van Allen radiation belts*3 that were affected by electromagnetic ion cyclotron waves. *1 Electrons: This research describes electrons as those having about one million electron volts (MeV), which is different from the main target of CALET. *2 Geomagnetic latitude: The bearing of geomagnetic latitude is determined based on the magnetic poles of Earth, not on such axis as the geographic latitude. *3 Van Allen radiation belts : The area where intense energetic electrons are held in place at around 10,000 to 40,000 kilometers above the Equator. Electrons in the Van Allen radiation belts surround and circle Earth without falling to Earth. As REP can damage satellite electronics and be a cause of ozone destruction in the middle atmosphere, further study may contribute to the prediction of space weather and atmospheric chemistry. The result of the study was published online on Geophysical Research Letters dated May 7, 2016.